Returns or sets the A1 format address of the current active cell within the selected worksheet. Returns or sets the Worksheet from the workbook whose content should be displayed within the control. Returns or sets a boolean indicating whether the spreadsheet allows adding worksheets. Returns or sets a boolean indicating whether the spreadsheet allows deleting worksheets. Returns or sets a boolean indicating if the grid lines are displayed in the selected worksheets. Returns or sets a boolean indicating if the row and column headers are displayed for the selected worksheets. navigated when Shift + Enter are pressed. The cell below should be activated. The cell to the right should be activated. The cell above should be activated. The cell to the left should be activated. Returns or sets the number of decimal places by which a whole number typed in during edit mode should be adjusted when isFixedDecimalEnabled is true. The height of the spreadsheet. It can be set as a number in pixels, string (px) or percentage (%). The widget height can be set in pixels (px) and percentage (%). The widget height can be set as a number. Returns or sets a boolean indicating whether the adjacent cell indicated by the enterKeyNavigationDirection should be navigated to when the enter key is pressed. Returns or sets a boolean indicating whether a fixed decimal place is automatically added when a whole number is entered while in edit mode. Returns or sets a boolean indicating if the formula bar is displayed within the Spreadsheet. Returns or sets a boolean indicating whether the control is in "End mode". mode will end automatically such as when one presses an arrow key. Returns or sets a boolean indicating whether the scroll lock key is toggled. performing actions that consider whether the scroll lock is enabled. Returns or sets a boolean indicating whether undo is enabled for the control. Set/Get the locale language setting for the widget. Set/Get the locale setting for the widget. Returns or sets the width of the name box within the formula bar. Set/Get the regional setting for the widget. Type="ig.excel.Worksheet" Returns or sets an array of the Worksheets whose tabs are selected. Returns or sets a value indicating how the selection is updated when interacting with the cells via the mouse or keyboard. The selection is replaced when dragging the mouse to select a cell or range of cells. Similarly when navigating via the keyboard a new selection is created. One may add a new range by holding the Ctrl key and using the mouse and one may alter the selection range containing the active cell by holding the Shift key down while clicking with the mouse or navigating with the keyboard such as with the arrow keys. The selection range in the cellRanges representing the active cell is updated as one uses the mouse to select a cell or navigating via the keyboard. New cell ranges are added to the cellRanges without needing to hold down the ctrl key when dragging via the mouse and a range is added with the first arrow key navigation after entering the mode. One can enter the mode by pressing Shift+F8. Returns or sets the position of the screen tip used to display the input message for the data validation rule associated with the active cell. The provided object should have numeric properties called x and y. The width of the spreadsheet. It can be set as a number in pixels, string (px) or percentage (%). The widget width can be set in pixels (px) and percentage (%). The widget width can be set as a number. Returns or sets the workbook whose information is displayed in the control. Returns or sets the magnification of the selected worksheets. Invoked when an action is executed on the Spreadsheet. Gets a reference to the spreadsheet widget. Gets the action that was executed. Invoked when an action is about to be executed by the Spreadsheet. Gets the action that is about to be executed. Invoked when the activeCell of the Spreadsheet has changed. Gets the previous active cell. Gets the current active cell. Invoked when the activePane of the Spreadsheet has changed. Gets the previous active pane. Gets the current active pane. Gets the active cell of the new active pane or null if there is no active pane. Gets the current visible range of the new active pane or null if there is no active pane. Invoked when the activeTable of the Spreadsheet has changed. Gets the previous active Table. Gets the current active Table. Invoked when the activeWorksheet of the Spreadsheet has changed. Gets the previous active worksheet. Gets the name of the previous active worksheet or null if oldActiveWorksheet is null. Gets the current active worksheet. Gets the name of the new active worksheet or null if newActiveWorksheet is null. Invoked when the Spreadsheet has started in-place editing of the activeCell. Gets the cell for which the control has entered edit mode. Invoked when the Spreadsheet is about to start in-place editing of the activeCell. Gets the cell for which the control is going into edit mode. Invoked when the Spreadsheet has ended the in-place editing of the activeCell. Gets the cell for which the control has exited edit mode. Invoked when the Spreadsheet is about to end the in-place editing of the activeCell. Get or set a boolean indicating whether the changes will be made to the cell's value when edit mode ends. Get a boolean indicating if the edit mode is being forced to exit edit mode in which case it cannot be cancelled. Gets the cell for which the control is exiting edit mode. Invoked when the Spreadsheet is exiting edit mode and the new value for the activeCell is not valid based on the criteria of that cell's ig.excel.DataValidationRule. The EditModeValidationError is raised while exiting edit mode if the new value for the activeCell is not valid based on the criteria of that cell's ig.excel.DataValidationRule. be taken using the action.Note: The validation rule will not be evaluated if edit mode is being cancelled such as when the user presses Escape to cancel edit.Note: The action will default to AcceptChange if the ShowErrorMessageForInvalidValue of the validationRule is false; otherwise it will default to ShowPrompt.Note: Like Microsoft Excel, only the validation rule of the active cell is considered even if the update is affecting other cells in the selection. Get or set the action to take in response to the failed validation. Get a boolean indicating whether the cell is allowed to stay in edit mode. Gets the cell for which the control is in edit mode. Get the rule which failed validation. Invoked when the Spreadsheet is performing an operation on a protected Worksheet and there is a single range that may be unlocked to allow the operation to be performed. Get an array of protected range objects that should be unlocked. Get a parameterless function that may be invoked to unlock the associated ranges. Invoked when a hyperlink is being followed in the Spreadsheet. Get the hyperlink to be executed. Invoked when the selection for a ig.spreadsheet.SpreadsheetPane of the Spreadsheet is changed. Get the pane for which the selection has changed. Invoked when the user will be prompted with a message regarding an operation that is being performed. Get a boolean indicating if the operation that triggered the prompt can be cancelled. Get a boolean indicating if a message will be displayed to the end user. Gets the exception for the error, if there was one. Get or set the message that will be displayed. Get the action that caused the prompt to be displayed. Invoked when a change has been made to the workbook that might require a save. type operation (e.g. changing the magnificationInNormalView). Changes the widget language to global language. Global language is the value in $.ig.util.language. Changes the widget regional settins to global regional settings. Global regional settings are container in $.ig.util.regional. A boolean indicating if the action was performed. Executes the action associated with the specified id. An enumeration or string that identifies the action to execute. Forces any pending deferred work to render on the spreadsheet before continuing. Returns an object that represents the pane with the focus. Returns an object that represents the current selection of the active pane. Returns an object used to get the formatting of the activeCell and where modifications are applied to the entire active selection. affected by the selection will have their Font.Name updated to that value. Returns an enumeration used to indicate the current edit mode state. Returns a boolean indicating if the control is currently editing the value of the activeCell. Returns a boolean indicating if the user is currently editing the name of the active worksheet. Returns an array of the panes for the activeWorksheet. Shows the filter dialog for the specified relative column of the filterSettings of the activeWorksheet. A region whose filter is to be viewed or changed. Optional enumeration that specifies the initial display of the filter dialog. A zero based column index relative to the region of the active worksheet. Notify the spreadsheet that style information used for rendering the spreadsheet may have been updated. Get the class applied to the tab item area button that is used to activate the next out of view tab. Get the class applied to the tab item area button that is used to activate the previous out of view tab. Get the class applied to the tab item area button that is used to create a new worksheet. Get the class whose style information is used to render the lines between rows and columns when a custom color has not been specified. Get the class whose style information is used to render the selection rect. Get the class whose style information is used to render the grip handle on the selection rect. Get the class whose style information is used to render the column headers. Get the class applied to the element where the column headers are rendered. Get the class whose style information is used to render the column headers when the mouse is over a header. Get the class whose style information is used to render the column headers when the column is selected. Get the class whose style information is used to render the column headers when some cells within the column are selected. Get the class applied to the vertical splitter bar that is shown when the worksheet is split horizontally. Get the class applied to the element that is displayed while dragging the vertical column splitter. Get the class applied to the dropdown button in the cells and header. Get the class applied to the dropdown button in the cells and header when the dropdown is expanded. Get the class applied to the filter dialog. Get the class applied to the 'Ok' and 'Cancel' buttons. Get the class applied to the name of the column being filtered. Get the class applied to the first condition. Get the class applied to the conditonal operator radio buttons. Get the class applied to the hint text. Get the class applied to the 'Show Rows Where:' label on the filter dialog. Get the class applied to the area that contains the elements for the formula bar. Get the class applied to the area within the formula bar containing the enter and cancel buttons. Get the class applied to the cancel button within the formula bar. Get the class applied to the enter button within the formula bar. Get the class applied to the button within the formula bar used to expand/collapse the height of the formula bar. Get the class applied to the formula bar expand button when the formula bar is expanded. Get the class applied to the element containing the text area within the formula bar. Get the class applied to the element used to resize the formula bar text area. Get the class whose style information is used to render the preview line displayed while a header is being resized. Get the class applied to the element that represents the input message from the data validation of the current active cell. Get the class applied to the content/body of the input message. Get the class applied to the title of the input message. Get the class whose style information is used to render the invalid data adorner. Get the class applied to the area that contains the namebox within the formula bar. Get the class applied to the element after the namebox that is used to adjust the width of the name box. Get the class whose style information is used to render the row headers. Get the class applied to the element where the row headers are rendered. Get the class whose style information is used to render the row headers when the mouse is over a header. Get the class whose style information is used to render the row headers when the row is selected. Get the class whose style information is used to render the row headers when some cells within the row are selected. Get the class applied to the horizontal splitter bar that is shown when the worksheet is split vertically. Get the class applied to the element that is displayed while dragging the horizontal row splitter. Get the class applied to the down scrollbar arrow. Get the class applied to the left scrollbar arrow. Get the class applied to the right scrollbar arrow. Get the class applied to the up scrollbar arrow. Get the class applied to the horizontal scrollbar. Get the class applied to the thumb on the vertical scrollbar. Get the class applied to the thumb on the horizontal scrollbar. Get the class applied to the track between the up button and the scrollbar thumb. Get the class applied to the track between the left button and the scrollbar thumb. Get the class applied to the track between the right button and the scrollbar thumb. Get the class applied to the vertical scrollbar. Get the class applied to the tab item area button that is used to scroll to the first tab. Get the class applied to the tab item area button that is used to scroll to the last tab. Get the class applied to the tab item area button that is used to scroll to the next tab. Get the class applied to the tab item area button that is used to scroll to the previous tab. Get the class applied to the select all button at the intersection between the row and column header areas. Get the class applied to to the element that is displayed while dragging the vertical column splitter. Get the class applied to the main element. Get the class applied to the element behind the tab area. Get the class applied to the element that separates the tab area from the spreadsheet pane area. Get the class applied to the element between the tab area and the column scrollbar that is used to adjust the size of the tab area. Get the class applied to the element displayed during the dragging of a tab to indicate the new position. Get the class applied to the element that represents the tab for a worksheet. Get the class applied to the element that represents the active tab for a worksheet. Get the class applied to the element where the tab buttons and items are rendered. Get the class applied to the element that contains the content for the tab for a worksheet. Get the class applied to the element that contains the content for the tab for a worksheet when the assigned color is calculated to be a dark color. Get the class applied to the element that contains the content for the tab for a worksheet when the assigned color is calculated to be a light color. Get the class added to element that represents the tab for a protected worksheet. Get the class applied to the element that represents a worksheet tab when it is selected but is not active. Get the class applied to the spreadsheet's tooltip. Get the class applied to the body/content of the spreadsheet's tooltip. Get the class applied to the title of the spreadsheet's tooltip. 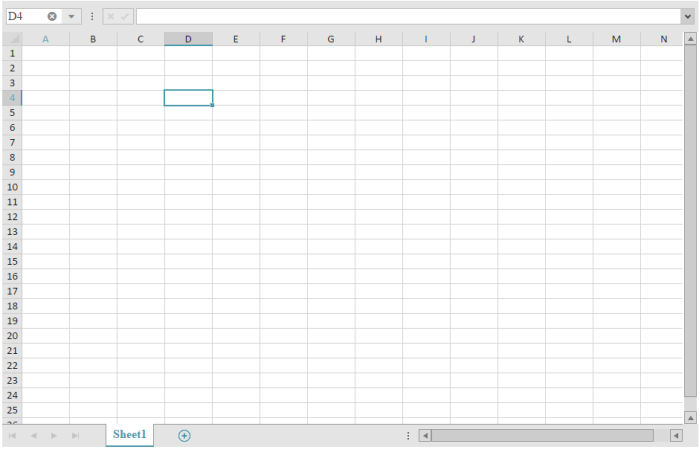 Get the class applied to main element, shown when the spreadsheet is opened in a non HTML5 compatible browser.